Moto Style. Outer shell: non-leather material. Long sleeve with half zipper accents and snap closures. Lining: 100% Polyester. In good used condition. Length: 25". Arm: 18.5". Black Rivet white keather jacket with floral interior. So super cute! Zipper details. Excellent condition. Measures 25" length, 19" across. New ListingKenneth Cole Reaction 174RU351 BLACK Zip-Front Faux Leather Long XL Jacket new! Kenneth Cole Reaction 174RU351 BLACK Zip-Front Faux Leather Long XL Jacket brand new! With tags! SEE ALL PICS Condition is New with tags. Shipped with USPS Priority Mail FREE! Wash care instructions: Machine Wash. Length/from shoulder to hem/ - 24". Bust /from armpit to armpit/ - 21". Waist/from side to side/ - 20". Item must beUNWORN ,UNWASHED, haveNO smoke odor orPET hair. On the back of the jacket will be noticeable marks …took a close up pic. Sweet with attitude! The brand is Live A Little and it’s a lightweight biker jacket. The body is cotton and the sleeves and collar are synthetic. Like new condition! 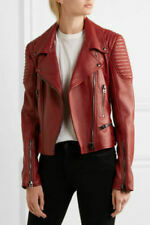 GUESS Faux-Leather Moto Jacket - Women's Size S. Shipped with USPS Priority Mail. Fashion Nova Suede Moto Jacket 2xl . Shipped with USPS Priority Mail. 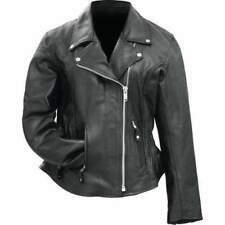 AUTHENTIC HARLEY DAVIDSON women’s black genuine leather riding motorcycle biker jacket. 100% thick heavy beautiful genuine leather specifically shaped and made for riding. 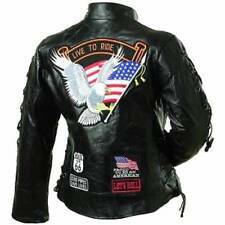 Has am embossed Harley Davidson logo on the back Marked size XS but fits a small perfectly. I’m 5’3” 120 lbs, and I am modeling the jacket in the last photo. Has lots of inner and outer zipped pockets and side buckles as shown. Pretty perfect condition, like brand new. No flaws. True black. Faux shearling inside. Style: moto sherpa. Allergies: There is a smoker in this household. Do this at your own risk! (laying flat, across): 18" pit to pit, 20" long (top shoulder to bottom hem). Color: black.